A new app called Crystal calls itself "the biggest improvement to email since spell-check." Its goal is to help you write emails with empathy. How? By analyzing people's personalities. Crystal, which launched on Wednesday, exists in the form of a website and a Chrome extension, which integrates the service with your Gmail. You can get a free "practice account," which gives you full service to the site and the Gmail add-on for two weeks and lets you look up people to see a personality profile. Once you've signed up (Crystal recommends signing up via LinkedIn), your Crystal account will generate personality profiles based on your public social media posts and pretty much anything else that comes up when someone Googles you. The Chrome extension will also make a button appear on LinkedIn pages, letting you view personality profiles of other LinkedIn users. At the end of two weeks, you still get access to basic features and have the option of upgrading to premium features. With the personality profile, you'll see advice on how to speak to the person, email them, work with them and sell to them. You'll even be told what comes naturally to them and what does not. Crystal also displays something called "accuracy confidence," based on how much information the app could find about the person. If it finds too little info, the accuracy confidence will be low; if there's plenty of public stuff online about the person, the confidence rating will be high. But even if Crystal displays a high accuracy confidence for a user, it's up to you to decide whether the personality profile is an accurate representation. I would say that this is a pretty accurate representation of me, though I found that many of my coworkers' profiles were fairly similar to mine. Maybe we all have similar personalities, or maybe Crystal isn't as perceptive as it purports to be. "There are 64 different personality categories someone can be assigned from Crystal, and some are closer to each other on the spectrum than others," Crystal founder Drew D'Agostino told The Huffington Post in an email on Tuesday. "From user testing and surveys over the past few months, we've confirmed that Crystal provides a 'very accurate' reading for just over 80 percent of profiles, and that is continuing to improve as the product gets smarter." As fun as it is to look up all of your coworkers and friends on Crystal, the really special part is how it helps you write emails. If you download the Google Chrome extension, Crystal will assist you in writing emails in your Gmail account. Crystal will appear as a little green button at the bottom of the email you're writing, suggesting a certain tone based on its assessment of the recipient's personality. Since so much of our communication, both in life and in work, happens via email, and it's so easy to misinterpret written words when they are without body language, facial expressions and tone of voice. The Gmail extension could add some voice and character to your emails, while helping you get to know someone. 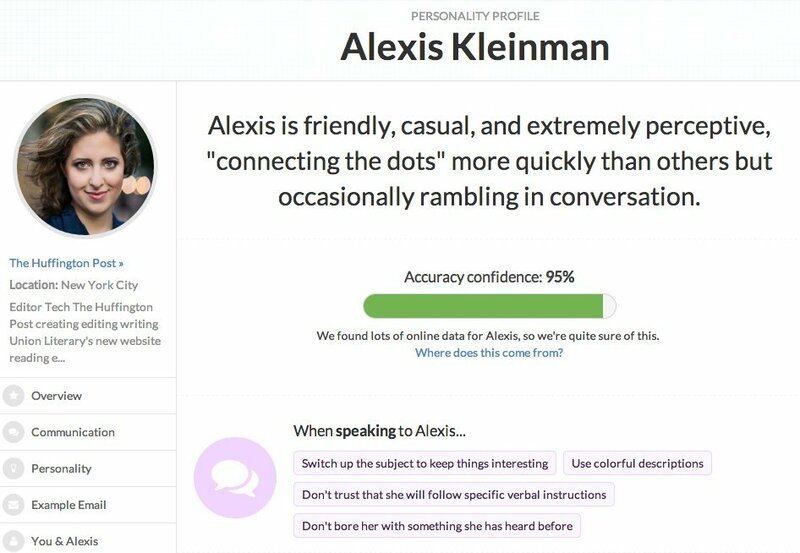 There are a few other sites and apps that combine social networks and email, like Rapportive, but Crystal attempts to create a holistic look at someone's personality and walk you through emailing them in an effective way.